Create and Implement a Compensation System which links the Variable Component of the Salary (of an Employee) to the Community Developmental works (Company Initiated Works) which he/she performs outside the Organisation. And by doing so, a strong link is established between Compensation System and CSR. The Corporate Social Responsibility Initiatives by a company is generally looked as an 'Eyewash Exercise'. shown seriousness in this regard. They have invested in new public welfare schemes etc.  How effective are these schemes?  How Employees look at these CSR Initiatives? generally fail for some inherent reasons.  Why CSR is Important? It improves the Economic & Social status of the Society. Community is strong, then there is a good chance that the organization will thrive. progress is not real and cannot be permanent." The Corporate Social Responsibility Initiatives by a company is generally looked as an 'Eyewash Exercise'. And one can frankly accept that It has been so, in the majority of cases. Only few Companies have shown seriousness in this regard. The Top Management may come up with new conferences saying that they have adopted a new Village,They have invested in new public welfare schemes etc. The Truth is, Majority of the employees don't really care about the CSR Initiatives. And these Schemes generally fail for some inherent reasons. It improves the Corporate Image & the Brand Value (especially when there is a Real Progress). To make Employees responsible for their Actions ,certain steps have to be taken. I believe that Linking their Salaries with the amount of Community Developmental Works that he/she performs, is the solution. 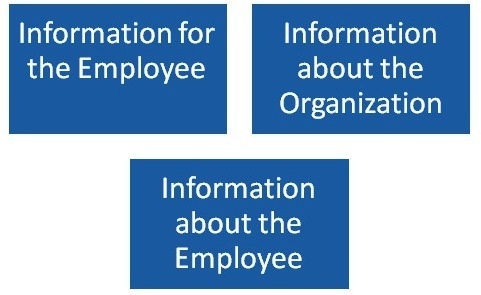 Organizations are not isolated entities, but they are highly Interconnected with the Community. If the Community is strong, then there is a good chance that the organization will thrive.
" So long as all the increased wealth which modern progress brings goes but to build up great fortunes,to increase luxury and make sharper the contrast between the House of Have and the House of Want, progress is not real and cannot be permanent." Developmental Work an Employee Performs. I believe that this should implemented at all levels (that includes Top Management). should be linked to his Performance in Community Developmental Activities (CDA). Let us see it in the form of an Equation. The Variable Component 2 can be measured in terms of Social Benefit Points (SBP). has spent, Quality of Work Performed, Number of beneficiaries etc. How a company should go about in doing Community Developmental Works? Economically Backward regions) per Project. those projects are responsible for the development of that particular Village. the regional office, Certain number of villages can be allotted to it. Certain number of Villages per Department. It can be based on the strength of the department. I think that the company can look at adopting Villages or other Socially-Economically Backward regions. The Solution to the problem will be the Linking of Compensation System to the Amount of Community Developmental Work an Employee Performs.I believe that this should implemented at all levels (that includes Top Management).I would like to explain the System with some illustrations. Let us take Employee 'X', whose monthly salary is $1000. Let us assume that the Fixed Component be $700. And the Variable component which is work performance related is $300. I would suggest that, Out of this $300 , atleast half of it, that is $150 should be linked to his Performance in Community Developmental Activities (CDA). 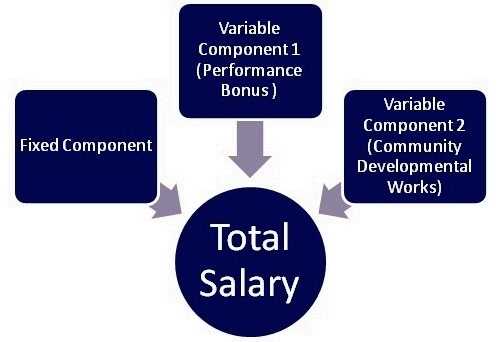 Variable Component 2 is related to the performance outside the organisation (Community Developmental Works).The Variable Component 2 can be measured in terms of Social Benefit Points (SBP). There is an Upper Limit to this. The Limit is equal to 15% percent of Total Monthly Salary. If one exceeds the Limit Continuously, he can be considered for Fast Track Growth (Faster Promotions, Better Incentives etc.) SBP can be measured by an Independent Agency. It can be related to Number of Community hours onehas spent, Quality of Work Performed, Number of beneficiaries etc. No.1: If it is a Service Based (Generally IT companies), Then Company can look at Adopting Villages (or Socially-Economically Backward regions) per Project.That is, If a company has 25 projects in its hand ,then ,It can adopt 25 villages . And people working on those projects are responsible for the development of that particular Village. No.2: If it is Product based, then Allocation can be done to Regional offices. According to the size of the regional office, Certain number of villages can be allotted to it. No.3. If it is purely a manufacturing entity, then Department-wise allocation can be done. In other words, Certain number of Villages per Department. It can be based on the strength of the department. The CDA can be organised based on free hours available. It can be a Compulsory Weekend Program(example: 2 weekends every month) or A Day can be allotted each week to the project team /department / regional office.I think that the company can look at adopting Villages or other Socially-Economically Backward regions. How the WWW (Internet) fits in? The Social Benefit Points (SBP) earned by the employees can be handled by a third Party (Independent Agency). This Agency should act like a registry (Database) of SBPs earned by the employees of the organisation. The Agency may also handle SBPs from other organizations (employees) as well. The Agency can put up the details of SBPs on the Web, so that the employees may know where they stand when it comes to Community Developmental works. Not only that, the average SBP per employee earned by the organization can be found out (provided many organizations are enrolled with the Agency). I believe this Solution can produce great changes that would speed-up the process of development ofthe society.  A real boost for Brand Image and Brand Value for the Organisation.  Long term gains are highly possible for the company.  The concept of sustainable growth is instilled into the minds of the Corporate.  At the grass root level, it improves the local economy.  Society gets real (tangible) support from the employees , and thereby real Progress can be achieved.  It is an Opportunity for the under-privileged to lead a dignified life. The Employees will be more serious about CSR than ever before. This is because their salaries are linked to the Community developmental works.The entire organisation will be aware of the plight of the rural people (when they adopt villages).Villages will get the right attention which they really deserve. Responsible Corporate Citizens will emerge. A real boost for Brand Image and Brand Value for the Organisation. The Average SBP per employee of an organization will show the status of CSR within the organisation. Long term gains are highly possible for the company. The concept of sustainable growth is instilled into the minds of the Corporate. The employees can know the status of their SBP (through Web). Other Organizations can see the history of employee (With regard to their SBP/Community Developmental Works), and thereby,the employees have an opportunity to showcase their achievements to potential employers.  Society gets real (tangible) support from the employees ,and thereby real Progress can be achieved.  Notify all possible changes (to the employees) in the Compensation System through all means. in a department or a regional office or a Project.  Announce the names of the possible beneficiaries (Villages or some Localities) of such a system .  Conduct Orientation Programs for all employees , so that they can know the changes which are done to the system.  Implement the system on a small scale for a short duration (say 2 months ). The Third party for handling the SBP has to be instituted. And a dynamic Web program for SBP has to be set up. Convey the changes done in the system to all other stakeholders by holding Press conferences & so on. Announce the names of the possible beneficiaries (Villages or some Localities) of such a system . I thank Mr.K.Viswanathan & Ms.Kala Nisha for their encouragement & support. I think most experience of corporate responsibility suggests this works best ie is most engaging when it is linked to an organisation's main business area, ie a retail store does something in the local community eg a manufacturer does something to develop engineering skiills. So I I'd suggest supporting more opportunities than just adopting villages. More importantly, I don't think Shameem Farouk was missing the point at all. Paying people for their individual contributions to responsibility risks dysfunctional outputs (in which individuals seek to maximise their time away from work regardless of the value to responsibility) and more importantly could detract from peoples' nature desire to be socially responsible themselves. Thanks for the comments. I think you have made an assumption that all people have the innate ability (& also willingness) to help the needy by giving some kind of opportunities. This may not be true in most of the cases. Unless, some driving force (during Initial - stages) is there, the 'help' will never be offered. I can see that , there are two different thoughts here. Sorry, I may sound little stubborn in my views. Because, I have seen such people (poorest of the poor) in my country. And I also had the opportunity to work for them. I agree with this though it might be as applicable to smaller companies. Smaller companies doesn't yet think about branding but they are more focused on increasing their profits to expand and get more leverage in economics. Though it might benefit the employee since there's an incremental increase in his/her salary... he/she might not have the same intent as you. CSR must be done with impact towards any society to make it sustainable. With this, we might create a culture of half hearted "help" towards the less fortunate, dont you think? Well... Perceptions differ. I think premature conclusions will lead us nowhere. I think, any framework when put to test, will give the results. And the results should be the platform on which conclusions can be arrived at. So, I believe that, this framework will be good for the society and can be applied at all levels (different companies, big & small). Only, Time can answer the hypothetical questions which are posed (with regard to the application of this model). Enthralling idea. Each Commercial Bank Branch if adopts this, it would be the stupendous feet of sheer culture. Thanks for the comment. Let’s hope such a thing will be implemented in future. I oppose using compensation systems solely to change people's mindsets. I don't think we are addressing the key barriers of adopting CSR initiatives among employees and there are negative consequences of incentivizing people for things which we want to institutionalize and make it as part of the culture. A key downside is curbing intrinsic satisfaction and motivation for doing things which are right. When you incentivize people they will come to expect it and will do things if they get compensated for it. Is this the culture that we want to promote? CSR is also quite an antithetical concept to purely mercenary concerns. This is the problem that we have today on trying to promote a social purpose beyond financial gains for the long-term. So I find this proposal a bit contradictory to promoting CSR adoption. Thanks for your comment. I would like to differ from what you have said. Money is definitely a motivation. Frankly speaking, I believe that no employee would come forward to help the community on their own. Incentive will definitely be a form of encouragement in making the employee play a role in the development of the community. First the employees should know the ground reality (in villages/ under developed areas). Most of the employees won’t know the plight of the residents in these villages. Hence I believe that this strategy will be an appropriate one. - leadership role-modelling (top management is a key driver of setting the values and practices for the organization). A credible leader and mentor which employees respect have great leverage in instilling values that are adopted in the organization. Through demonstrations of top management in various outreach programs and the commitment to the cause and change that it has created for people and the environment, employees will come to realize the type of values that top management will recognize in return and expect its employees to possess. For example, employees who clearly do not posses this core value of the company should not be promoted to leadership positions. In some homes, this is the value that the family adopts. Unfortunately, our heavy financial orientation in decision-making clouds the continuous adoption of good values at times. - Making CSR as part of leadership development program. CSR is part and parcel of your readiness of becoming a servant and transformational leader. There are studies for example that show that students who participate in human development programs in destitute communities show greater leadership skills and undertake leadership positions subsequent to their experiences. The sense of satisfaction, duty, and ability to create a difference inspires people to action and create changes. Great leaders do not expect to be paid for their service in order for them to do something for their employees or people - unfortunately we have scarcity of great leaders in companies running today. - institutionalizing the requirement for community service by getting employees involved in meaningful projects that will create tangible outcomes for people. Many consulting companies for example, have requirements for their partners and senior management to be part of a non-profit organization or to be involved in community service as part of their leadership development. The satisfaction that you get from seeing that you are able to help others, particularly those whose lives you are able to transform and elevate to a greater level creates the momentum for inspiring and creating a difference that will help organizations in return to prosper in a sustainable manner. The appreciation that you receive from those whose lives you are able to touch provides a far greater sense of satisfaction than the monetary rewards for doing it. In summary, I think providing money to encourage a non-financial orientation like CSR is not only contrary to the essence of CSR but is also wasteful with potentially negative consequences to behavior and culture in the long run. Most of the Employees are not aware of the ground reality (Plight of the Villages / under-developed areas). Employees are not naturally tuned (inside their heads) to help the under-privileged. Employees need some kind of a motivation (more during the initial stages) to make them undertake community developmental work. I believe that linking of a part (just 15 %) of the salary to the performance of the employee in community developmental works will make the employee aware of the situation. Not only that, when an employee does more amount of CSR work, obviously he can be given better incentives. I dont see anything wrong in that. The point is “Helping the Under-privileged’. If my framework succeeds in doing that, then I will be the happiest person on earth. Very interesting article. I like the Village concept, it brings reality into the process. I would argue that a stronger link could be made between villages and the economic activity of the company : invest in villages whose ecosystem is somehow linked to the activity of the company (talent, raw materials, potential market, ...). There is probably a need also for long term benefit calculation, that would demand involvement of finance officers, so as to be able so sell the project to c-level people. Thanks. I agree with you. There should be a strong link between Villages (& other less developed areas) & the Corporate world. CSR should not be an eye-wash exercise, but should be a productive one. Corporates should try to shed their 'Profit-centric' Approach. Sounds easy, but hard to Achieve. I strongly believe that 'sustainable development' is the need of the hour. And when it comes to the calculation of benefits (arising out of CSR iniatives), a mechanism has to be developed.